These are the words of a great woman, a great queen whose destiny weaved together with that of the country she dedicated her life to - ROMANIA. Quaint, picturesque castle. Today’s post reveals a few intriguing phenomena that take place at the Pelisor Castle, Queen Marie’s favorite place. Situated in Prahova county, Romania, Sinaia is one of the favorite holiday places for people who enjoy the fresh mountain air. Among its many touristic attractions are historical buildings like the Casino, built between 1912-1913, the royal Station and above all The Peles Castle and its smaller brother Pelisor. Pelisor was built in 1899–1902 by order of King Carol I, as the residence for his nephew and heir, the future King Ferdinand and Ferdinand's consort Queen Marie. Queen Marie herself, an accomplished artist, made many of the artistic decisions about the design of the palace, and took active part in its decoration, as a painter. 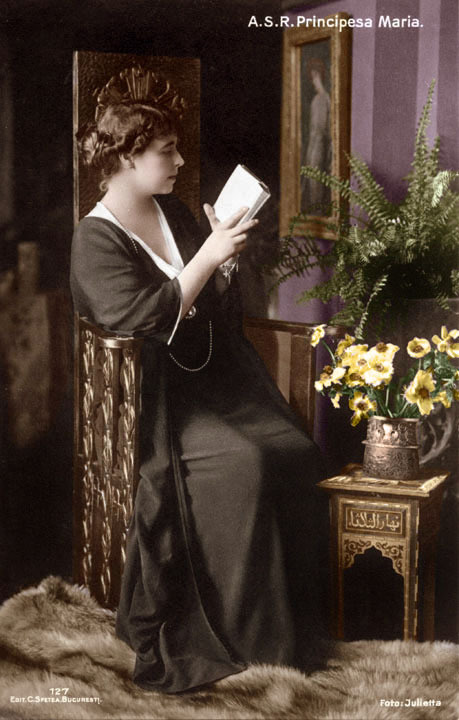 In Queen Marie’s opinion, Art Nouveau was a weapon against sterile historicism. She practically created a personal style by combining Art-Nouveau elements with Byzantine and Celtic elements. Here she created a world of her own. The rooms are decorated by her under the influence of ancient Celtic, Scandinavian and Scottish myths of eternity or of the Celtic-Scottish myth of regeneration and eternity.Pelisor Castle includes several chambers, working cabinets, a chapel, and "the golden room". A queen's testament. Five years before her death, Queen Marie, feeling her passing through this world was coming to an end made a testament in which she requested that her heart should be buried on Romanian soil. As a permanent link between the Queen and her country. She regretted she was dying. She also asked to be dressed in cardinal purple. She died at Pelisor the place she loved so much. Ten years after her death, on 10May 1948 the Golden Chamber filled with Queen Marie’s favorite perfume Quelque Fleurs Royale India Violettes. She’d received a small vial of this special perfume from a maharajah. An odd thing remarked by people who were in the castle at that time was that the perfume didn’t leave the room to waft to the other chambers. The smell appeared again on 25th October the anniversary of King Michael of Romania and again, later the same year on 30th December on the date he was forced to give up his throne by the communist regime brought by the Russian invaders. The Haunting Perfume. The fragrance kept reappearing in the castle, always at dates of importance for Romanian monarchy. Intrigued by it, the new rulers strengthened the guard and watched to see if there was someone who played a trick. But the smell started mocking them, jumping from one floor to the other in the most unexpected places and moments. It seems the fragrance was felt again on the day of Petru Groza’s death and later at Gheorghiu-Dej’s death, (both communist leaders of Romania). Could the queen have tried to take revenge against those who stole her country? Or she wanted to warn them she was keeping vigil? In her time, the queen advertised this perfume "Mon Budoir,”created by a great French house of cosmetics. 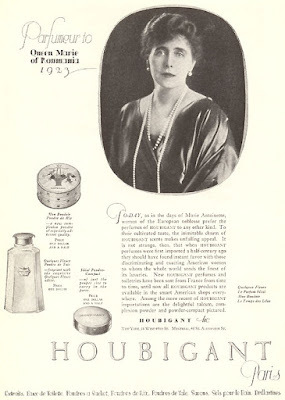 When she died the perfume was withdrawn from the market as a sign of respect. Castle returns to its legal owners. 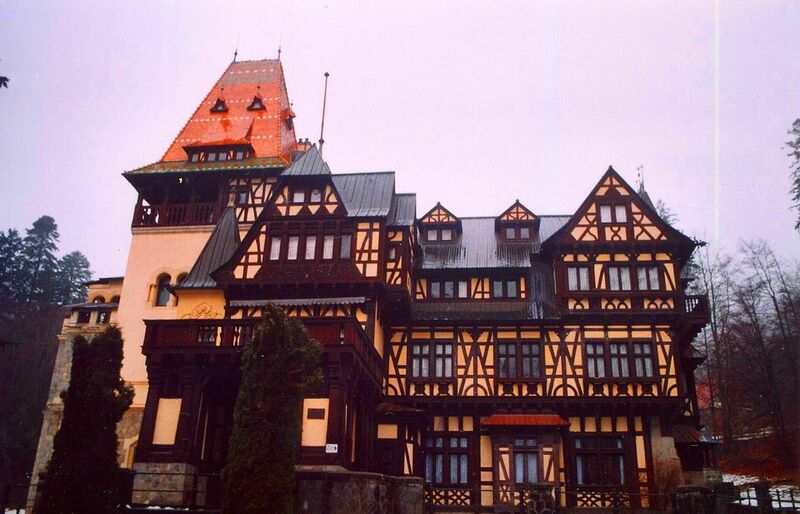 In 2006, it was decided that the palace complex, including Pelişor, long a museum and tourist site, is the legal property of the heirs of the Romanian royal family. King Michael I of Romania, finally back in the country after the long exile and the mean attitude of the new authorities after the 1989 so called revolution, who didn’t allow him first to enter the country as was his right. appears decisive that of the complex, Pelişor castle will remain as place for his heirs, the Royal Family. A wonderful post for an fascinating lady. My knowledge of the history of modern Romania is sadly lacking, but I have always been drawn to the general area and the ancient history there. I love Marie's decor aesthetics and the way her violet perfume permeates the air at strategic moments. Violet is my favorite too. Thanks for a great post. To tell you the truth, I found out many things on Romanian Royal House only now. All the years before 1989 we weren't allowed to speak about the monarchy and history books denigrated King's name. Perhaps our life would have been better if monarchy had been reinstalled after dictatorship's fall. But the second echelon of "reds" who took the power and turned Romanians into a nation of paupers now, made sure it couldn't happen. Romanian King, Michael of Romania, is the only leader who took part in World War II and is still alive. After many years, he was allowed to return and settle in Romania, but he's old - 93 and he's had only daughters. His house was infiltrated by people who, I'm sure, will see that no offspring of the family will request the power back. Queen Marie sounds like a remarkable woman. I love how her perfume permeates the air of the castle, letting others know she still has her eye on the country she loved. Also sad to hear what happened to King Michael. I am glad he was eventually permitted to return to his land. A fascinating look at your history (with a very cool legend included), Carmen! Thank you for checking the post, Mae! A remarkable woman indeed. Something like that is what's missing right now over here. People who are devoted to their country not to their wallet. Fascinating post, Carmen. I love getting glimpses into Romanian life and history through your eyes. Queen Marie sounds like a remarkable woman, and one who, perhaps, never quite left the country she loved. I wonder, was she one of Queen Victoria's granddaughters? Or otherwise related to the family? Glad King Michael and his heirs have been allowed to return to the country, even if they will never rule again. Thank you for dropping by, Linda! Yes, Queen Marie was closely related to British Royal family. Born into the British royal family, she was titled Princess Marie of Edinburgh at birth. Sad that during communist year her name was muddied. Several biographies of the royal family described Marie either as a drunkard or as a promiscuous woman, referring to her many alleged affairs and to orgies she had supposedly organised before and during the war. Now things are put in place, at least, on documents issues. Yes, the King returned but I fear he was allowed it only after agreeing not to ask the throne back. And communist years and lies brainwashed people here! I still hear on TV stories that he left the country with train wagons filled with gold and valuable paintings! It's an example of manipulation. thanks for sharing your post today. That building looks stunning, and it's great to learn a little about Romania ... As I've told you, I've got fond memories about our holidays there all those years ago. That building is the smaller Palace. You should see the Peles big castle! Yes, I know you visited once these places. I hope they were pleasant moments. Thanks for visiting and leaving a comment, Iris! What a beautiful castle and a story to match. I'm glad the land reverted back to the rightful owners and love the story about Queen Marie. Thank you for sharing, Carmen! Thank you for checking the post, Calisa! Yes, at long last a part of the land was reverted to the Royal family. Not the rule though. I love stories like these! Thereis so much more than meets the eye. Absolutely! And this woman, a real LADY had an important contribution in the development of the country at that time. In the positive way, I mean. a pity no more such people exist today. Thank you for visiting and leaving a comment, Catalina! Much appreciated.